OC Integrative Medicine consists of a family of medical doctors and acupuncturists that strive to care for patients as they would for their own family. Their goal is to optimize your health by getting to the root cause of your health problems. They utilize a holistic treatment approach that addresses all facets of your life. They believe in preventative medicine and strive to optimize your health so that you feel and look your best. 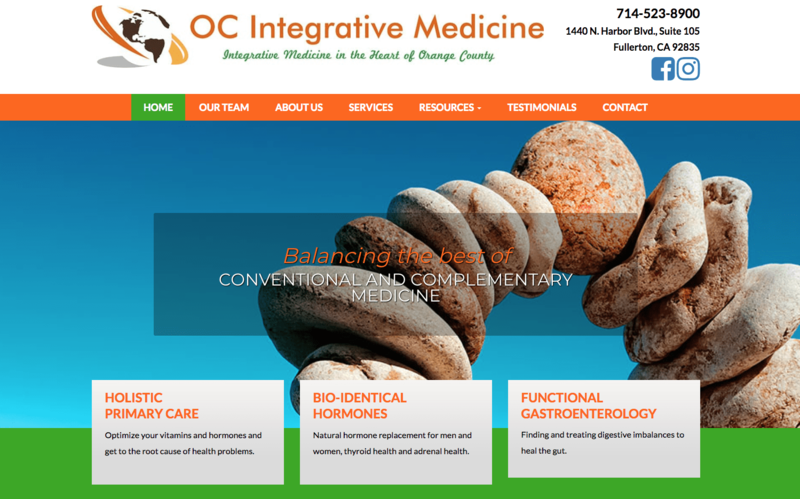 The doctors at OC Integrative Medicine wanted a vibrant medical website using bright colors such as orange and green. Their belief in a holistic approach to medicine is emphasized using these bright colors. Plenty of white space throughout the site allows patients to easily read their practice information. The overarching design of the webpage incorporates a squared-off theme with a simple homepage. Simplicity is key in this situation. The navigation menu bar is a host to all sorts of additional information including biographical about Dr. Rajsree and her team as well. The personalized logo also adds a small touch of creativity to the already standout website. When most of us think of integrative medicine, we think about dieting, exercise, and supplements. We went ahead and incorporated the food theme within the orange and green color scheme. We wanted to literally integrate their theme of “getting in your roots” throughout the colors on the website. As a result, the page is made to resemble the colors of a carrot! The homepage features multiple rotating photos (stylized to fit a modern vibe) and clear, legible writing. Orange – represents energy and motivation, perfect for the specialty at hand! Green – represents health and rejuvenation – much like the integrative medicine benefits! This website utilizes a full-width layout, which ensures all of the available space on the site works together for the benefit of the visitor across all types of viewing platforms. We also included a tile-image menu on the home page, which includes subtle responses when the viewer mouses over each tile. All the images also help advertise and engage with visitors for increased persuasion. Integrative Medicine’s website features SSL security and a call to action on every page. There is a subscription to her newsletter available at the end of each page to boost incoming traffic. As noted earlier, all the pictures on the website are dedicated appropriately to fit the integrative medicine mold. Their services tab (located on the carrot orange navigation bar) also features additional information to encourage clients to read up and explore further. All in all, the combination of images, formatting, and visuals play a perfect role in representing the vision of integrative medicine by the OC natives. In addition to the site’s use of ADApt and SSL security, the OC natives boast only the best ingredients and nutritional benefits to their supplements on the website. All the design elements all harmonize together to create one energized website!